Media blogs increasingly have held traditional news outlets accountable for their errors. One such Web site, "Regret the Error" (http://www.regrettheerror.com/), holds media accountable for their corrections. With all the talk lately about "relevance" as newsrooms become "information centers," we might acknowledge that accuracy plays a role in relevance and that information is correct or incorrect. To be relevant (and informative), newspapers also must be credible. What the Internet does best is present a snapshot of the world or some aspect of it at any day or time. This study, then, is a snapshot of the state of corrections in U. S. newspapers based on the comprehensive work being done on that topic by Canadian freelance writer Craig Silverman. Since its launch, "Regret the Error" has gained international recognition for its meticulous scrutiny of corrections, with acknowledgment as a Yahoo! Pick, a USA Today Hot Site Pick, a Good Housekeeping Site of the Day, and Forbes "Blogs that Matter" in that magazine's respected Best of The Web awards in summer 2005. Readers of Silverman's blog can send in published corrections, especially from local and smaller news outlets, which he then fact-checks. Additionally, he scans the corrections pages of 80 different media outlets and uses Google keyword tracking and Factiva database searches to read between 200 and 350 corrections daily and states, "I am fast approaching my 100,000th reading of a correction." Despite the volume of corrections that Silverman analyzes, he notes that "corrections themselves differ from one publication to the next because there is no universal standard. For example, everyone is aware of the need for an expression of regret or apology at the end of each correction, but how this is actually printed is left to the respective publication." Some publications always state the incorrect information within the correction, he notes, "while others simply note the fix. Some place corrections within the section where the error occurred; others put them in the same place every day. If a correction was delayed, some publications will note why; others just run a normal correction. This lack of consistency can make the process seem haphazard." In particular, Silverman observes that corrections increasingly lack explanations about how the error occurred or the steps taken to prevent errors in the future, leaving readers with the impression that the journalist's main concern is defending the publication rather than owning up to any error. This is why Silverman has called for "a wholesale reevaluation of how publications prevent, correct and communicate errors to their readers." 1.Identify the error (what it was, when/where it occurred). 3.Do so as soon as possible. 5.Provide an explanation to the audience or clientele. 6.Disclose how the error could have been avoided and/or how it will be prevented in the future. 7.Issue an apology to those damaged by the false disclosure. Inasmuch as this study focused on newspaper corrections posted on "Regret the Error," the list of criteria was sent to Craig Silverman for his opinion. He agreed in an e-mail that the list constituted completeness. Data were gathered using a content analysis of U. S. newspaper corrections compiled during 2005 by "Regret the Error." The blog also compiles corrections found in other media, older corrections, articles and interviews. However, our study focused only on newspaper corrections so the unit of analysis was individual U. S. newspaper entries recorded in 2005 by this Web site. Some 631 corrections from 70 newspapers were examined. We also classified errors into the categories of "objective" and "subjective." Objective mistakes contained factual or mechanical errors, such as misspelled names or misplaced headlines. Subjective errors were omissions, assumptions or errors in judgment. Fabricated/plagiarized material was placed in the subjective category because it reflected poor judgment, although examples may contain components of each category. Limitations of the study obviously involve how Silverman searches for and compiles corrections. Beyond that, he noted in an interview, some publications, such as the Orange County Register, only place that day's correction on their corrections page and then remove it the next. Other newspapers keep a week's worth of corrections online, while still others keep it for a month. Many newspapers keep corrections permanently online, although they often charge for items in their archives after a certain amount of time. According to Silverman, "This scattered, non-standardized reality is unfortunate and demonstrates that the industry has not created an accepted manner for displaying and archiving corrections online." Moreover, he notes, some publications archive corrections separately or link them to certain stories online. The New York Times and Washington Post place the correction within the article online and in the archived version of the article. Corrections are also placed on a static online corrections page, and each day's corrections are also archived as a separate article. This approach is the most comprehensive, states Silverman, who adds: "Yet I see many newspapers that will post a correction online and then neglect to correct the story itself. Many do not archive corrections on their own, which is also unfortunate." Additionally, his research shows, some newspapers only publish corrections online for stories that are placed online. Some only update their online corrections every week or every few weeks. "The reality today is that online corrections are handled very differently across the board." Naturally, these variables limit our study but do not negate its importance, primarily because "Regret the Error" remains the only nationwide barometer of major newspapers' treatment of corrections. As such, by compiling a year's worth of data, this study is as complete a snapshot as possible given the varied and scattershot print and online correction practices of newspapers. prominent, accounting for 83.7% of the sample of corrections. 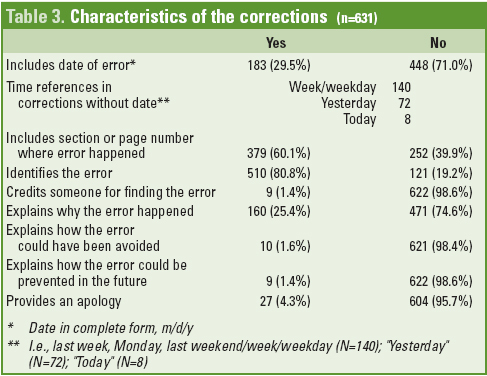 Subjective errors constituted 17.1 % of the total number of corrections (see Table 1). The location where the error occurred (article, headline, etc.) also was specified in most of the sample (see Table 2). 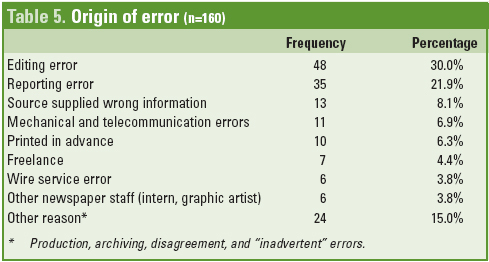 Both types of errors were most commonly present in articles (stories and reports) and editorials and columns. Interestingly, errors made in headlines, reviews, illustrations, and obituaries accounted for 20% of the total locations (see Table 2). In addition, 24 of the corrections included mistakes that happened in two places within the same issue; but only two corrections referred to an error found in three or more places. When specifying when the error happened, only 30% identified the exact date (mm/dd/yy) of the mistake. More commonly, newspapers included a reference to a day of the week (140), "yesterday" (72), or "today's" errors (8) (see Table 3). Some 60% of the entries included either section or the page number (the only identifying information in 91 instances). It is worthwhile to note that 28 errors occurred on the front page (see Table 3). Silverman has asserted that newspapers often do not repeat the specific error but merely fix it. We found this conclusion not to be entirely accurate, as only about one-fifth (19.2%) omitted the original mistake with 80.8% identifying it (see Table 3). Most of the corrections were written to fix a single error. However, in 72 instances, or 11.6% of the sample, the correction was used to fix two mistakes and in 7 cases (1.1%) to correct three or more errors. Rarely did the correction contain information about who discovered the mistake. 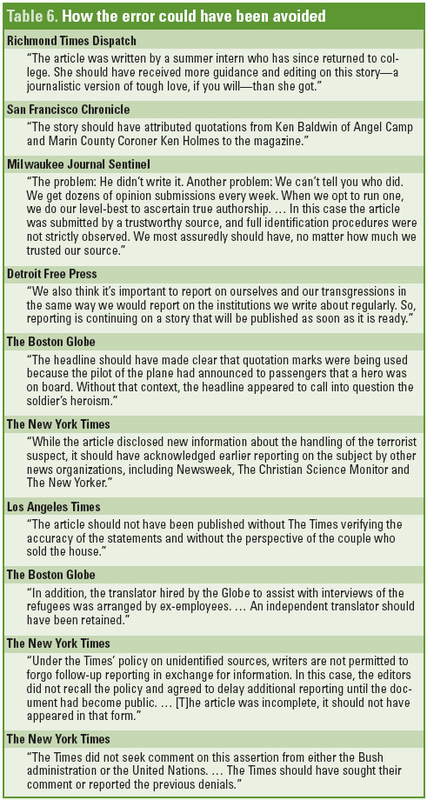 Only 9 corrections credited a particular person for informing the newspaper about the error. On four of these occasions, readers alerted the medium. Three times a source contacted the medium. Police and another newspaper contacted the medium once apiece. Corrections were also categorized based on the information cited to fix the error (see Table 4). Most of the time, and especially when dealing with factual errors, the corrections presented the right information as it should have been published (71.6%). Newspapers sometimes published a "clarification" to accompany the correction (5.9%). 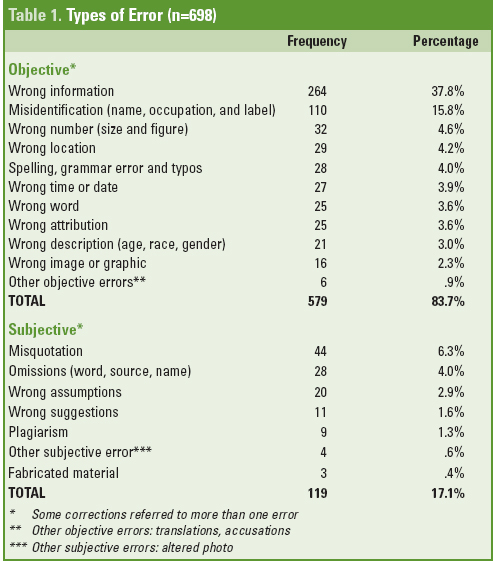 For subjective mistakes, the most common way to amend them was to publish a clarification (13.6%). On 4 occasions, the newspaper decided to publish an entire new story. Surprisingly, almost 5% of the corrections simply identified what was wrong and neither included the correct information nor provided a clarification. While the majority of corrections do identify factual characteristics of the error, such as date, section, or location, most of them leave the question of how the error happened unanswered. 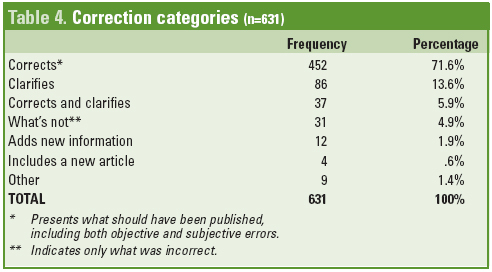 Only 160 out of the 631 corrections explained why errors occurred: Editing and reporting were the most common mistakes followed by errors due to incorrect information supplied by a source (see Table 5). A characteristic of almost the entire sample was the absence of information about how the error could have been prevented, and/or how it could be avoided in the future. Of the 631 corrections, only 10 included how the error could have been avoided (see Table 6) and only 9 how the paper anticipates similar errors will be prevented in the future (see Table 7). 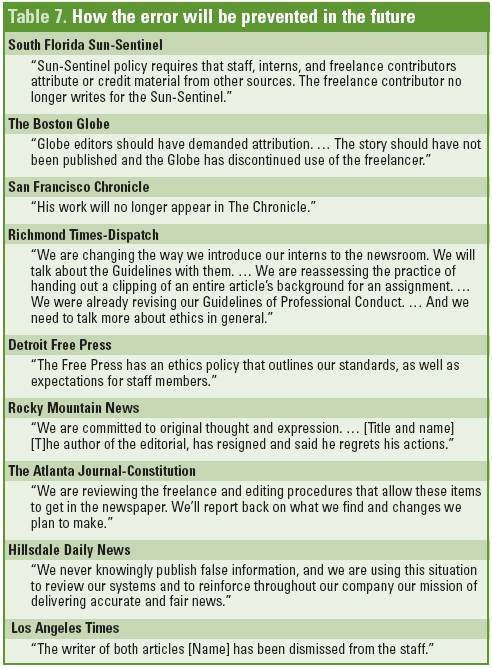 Based on this 2005 sample, newspaper editors accept corrections as an important responsibility to readers that also serve to increase the newspaper's credibility. Corrections tell the readers that accuracy is important enough to call attention to errors and correct them. The corrections found on this Web site predominately referred to errors classified as factual or objective, and referred to very few subjective errors. The most likely reason for this is that objective errors are easier to identify and correct. It takes very little time and space to correct a wrong name or number. The subjective errors based on wrong assumptions or misguided suggestions, require more space and time to explain. In fact, some subjective error corrections require a complete rewrite of an article, which is something this study found happening only four times, or less than 1%. Issuing an apology is so fundamental that "Regret the Error" is named after it. Apology or regret was expressed in only 24 instances (4%). The question of why it is so difficult for newspapers to apologize is the subject of much discussion. In some cases the absence of an apology might be traced to the advice of lawyers. However, in many cases the origin of the errors found in this and other studies is more likely to be attributed to someone or something outside of the newspaper or worse, to something "inadvertent." Inadvertent errors on occasion can be viewed as negligent, something the editor or reporter should have known but overlooked. The problem with these substitutions for an apology is that, no matter with whom or where the origins of the error lie, mistakes more often than not track back to the actions or inactions of reporters and editors. As such, no justification can be considered a replacement for a clarification or, in the case of false information, an apology. Also noticeably absent in the vast majority of cases analyzed was providing a reason why the error occurred and how it could have been avoided. To the extent that journalists attend to corrections, information about how the error could have been avoided and prevented would be valuable not only in terms of accuracy and credibility but also in the training and continuing education of journalists. It is logical that specific information about corrections is something that readers would want to know, particularly coming from a business based on the public's right to know. Such introspection on the part of the newspaper demonstrates to the reader the recognition that an apology without self-examination is incomplete. Also of concern in this study were 9 cases of plagiarism and 3 cases of fabricated information. A stark indication of loss of credibility is that the number of newspapers correcting plagiarism occurs as often as corrections explaining why any sort of error had occurred. A discussion about plagiarism and fabrication is beyond the scope of this study. Suffice to say, however, that some errors needing correction are worse than others, and incidents of plagiarism and fabrication damage credibility far more than such mistakes as a misidentified job title or even a wrong attribution. Newspapers generally performed well in correcting the record, in varying degrees and ways. For example, the overwhelming number, 575 (91%), corrected the record by publishing accurate information or providing clarity or both. The seven components of completeness in corrections presented here can provide guidelines for newspapers and other media to improve the process and effects of corrections. As D. Charles Whitney states in his 1986 study, "any good corrections policy should include a systemic recording and regular review of corrections. "3 Our recommendations embrace and go beyond Whitney's, focusing on completeness and transparency. Editors or ombudsmen should keep detailed records not only of corrections but also of their completeness. Monthly and yearly round-ups in columns detailing and regretting those errors also would have audience appeal and should have the cumulative effect of re-establishing credibility and re-instituting a culture of high standards and accountability in the newsroom. The types of error (objective or subjective). The number of errors presented in weekly, monthly, and annual round-ups. 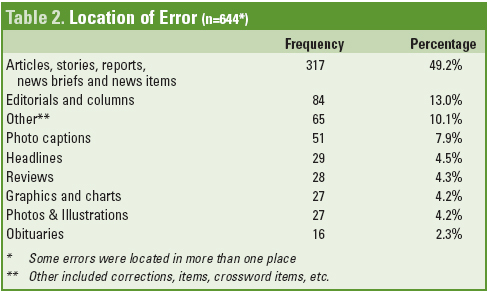 The number of errors in each section of the newspaper (e.g., national, metro, business, sports, etc.). Results of unannounced post-publication spot fact-checks in each section. "Accuracy barometers" with graphics showing increases or decreases over time in number of errors needing correction. We recognize that newspaper staffs, not to mention unions or organizations that often represent them, might object to publishing journalists' names and the number of errors committed by each. At the least, our guidelines can be applied internally, reducing the incidence of error. Newspapers can also enhance credibility by rewarding reporters not only on "productivity" but on "accuracy," too, assessing performance based on the number of corrections, with those having fewer corrections receiving recognition for a job well done. In the end, as this study also demonstrates, the importance of complete corrections in advancing the credibility of newspapers is surpassed only by the importance of thoughtful evaluation of why the errors happened and the ways future errors might be prevented. 2 D. Charles Whitney, "Begging Your Pardon: Corrections and Corrections Policies at Twelve U. S. Newspapers," Gannett Center for Media Studies, 1986. The above article was published in Media Ethics, Spring 2007 (18:2), pp.7,20-25.